Sammy Clingan has extended his stay with Glenavon to another season. Pic by INPHO. 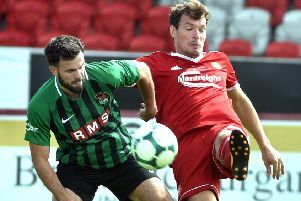 Gary Hamilton is expanding his summer search for signings beyond the Irish League but highlights one player’s decision to remain on home soil as a major boost. Hamilton has deals confirmed for Niall Grace and Conor McCloskey from, respectively, Institute and Ballymena United but considers the Northern Ireland market as one of limited future value. However, Sammy Clingan’s decision this week to postpone a return to Scotland and extend his Glenavon stay by another season serves as a welcome summer signing for Hamilton. “Sammy is getting married this summer and his original plan was to return to Scotland after two years back home,” said the Glenavon boss. “However, they have decided to stay in Northern Ireland for another year and we are all delighted. “Sammy’s value on and off the field is massive and he is really playing with a smile on his face at Glenavon, which helped him clock up more games than expected last season, not to mention a double-figure goals tally. “We all work together to manage his playing time towards trying to avoid more injury problems and I know how much he has loved the camaraderie around the club. “We cannot give Sammy enough praise. He is a superb professional and brings quality on the pitch with his own game but also sets a wonderful example off it in terms of showing younger players how to go about your career. Hamilton secured McCloskey’s signature last week on a two-year deal following two unsuccessful previous attempts to get the winger on board with the Lurgan Blues. “Conor has pace, quality and work-rate, all qualities that fit right into our way of playing,” said Hamilton. “We feel Conor can make a real impact here and also offers real versatility. “I tried to see him twice in the past and feel the Irish League has not yet seen the best of Conor. “We are still searching for players and certainly stand short in defence but do not see the right value or quality in Northern Ireland. “At the minute we have two centre-backs at the club and one for each of the full-back positions, so it could be a case of looking at someone versatile.